There is an episode of Seinfeld where Jerry and Elaine are watching a movie, I want to say it was Chunnel, and they are having a dialog, a running commentary throughout the entire movie. Michael Collings has done a similar feat. He has created an opus for B space movies with a Greek chorus interpreting, interrupting, and raising a rousing ruckus that tickles not just the funny bone but the entire cerebral cortex. You can't measure the true love and dedication of Trekkies, Star War fans, Space Station Nine Groupies, or even people who adore The Blob, The Thing, or The Ring fanatics. Their attention to detail, the hours devoted to discussions on non-existent technology, the obsession over getting the minutia of artificial universes to make perfect sense and is as amusing as it is admiral. 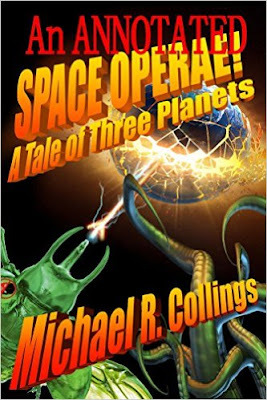 Michael Collings takes a sharp stick and pokes fun at the neurotic interests of sci-fi geeks and raises the bar for the genre in his book An Annotated Space Operae! His story is mundane in the world of outer space. Bug-eyed monsters, travel the universe feeding, killing, their mission parodying the legions of space travelers we've adored before them. Whether it's Captain Kirk, Commander Piccard, or even Darth Vader, the pattern of speech is easily recognizable, the situations a puzzle fitting into it's prescribed spot as if it always belonged there. His prose is beautifully rendered, descriptive, never vague, the words chosen wisely. His insect men use their bodies, making us see, hear,smell, and feel them. "But even better, the slight crackle of roasted tissue as Torq and his numbers strode triumphantly across the blackened landscape, treading on the crusted remains of the now-vanished aboriginals. His ventral plates quivered rhythmically." What makes the book stand out is his panel of advisers, the uber-educated annotators filling in the gaps with snarky commentaries, excuses, and explanations. Criticism mix with witticism creating a side-show, a story within a story that steals the spot-light like young ingenue from an aging starlet. Move over Eve, a new hybrid has arrived. They pop in and out of his tale, debunking, steering, and finally mocking the author into compliance to their wishes. Note what his annotator PIP has to say when a new character is introduced. "PIP—Our Author can’t have intended this, can he? SFX—What? PIP—The verbal paradox. How is it possible to have a Cwrth (pronounced cooth) that is not only uncouth but that epitomizes that state? CSI—Well, there are inhuman humans, aren’t there? PIP—I would argue not. There are humans whose actions are—or seem—inhuman, but the individuals remain human. Otherwise those actions would not be heinous, merely another order of bestial. CSI—So … when is a Cwrth not a Cwrth? When it is uncouth. 217 LPG—Now, this is more like it. Surely we are entering Lovecraft territory, with unfamiliar geometries and an inherent sense of darkness. SFX—Possibly, but the description also suggests C.S. Lewis’s “Objective Room” from That Hideous Strength..." Wordplay at it's finest. Who are these characters,the arbiters of this novel, you ask. Collings explains them- "Let me give it a try. An annotator who never actually existed but whom we have “no longer got” and who never had a voice in the first place, speaks from somewhere, where he no doubt is not, and the sounds, which do not exist, echo from a reflective surface, which we have not got, to repeat the words of a character, who also does not exist, in a story, which has no tangible reality, made up by Our Author … who we apparently cannot trust. CSI—He’s got it. By George, I think he’s got it." And by George, I think he's on to something spectacular. They serve the purpose for the explainable, the annoying process of assigning human traits to the inhuman making it palatable for our reasonable brains to process. They discuss the facts as if they were written from ancient laws, the results of endless study on the subject, with the same attention to details as a series on The History Channel discussing theories on crop circles or Big Foot. " SFX—An additional touch of SciFi jargon. I find it fascinating to note how much our Author has taken for granted about the Koleic thus far: no discussion of their ships’ propulsion systems, for example; no systematic discussion of their lives, if any, beyond their numerical functions; not even any specific height, weight, or other dimensions. It is almost as if he doesn’t care. LPG—Also note that the assertion of science and technology is immediately undercut in the next paragraph by a conscious shift to a supernatural, paranormal explanation. PIP—The shift reminds me of the transition from science fiction to fantasy in Stephen King’s original edition of The Stand (1978), as otherwise science-oriented characters begin having premonitory..."
In Collings' capable hands, the subject is real, happening in real time. He has given it the respect as a scholar, mixed in legitimacy, tempered it with respect, yet infused it with humor and warmth. He is not making fun of the genre, he has embraced it with love, finding the sweet spot to laugh with it, not at it. If he writes another, all I have to say is , "Beam me up, Scotty!